This book focuses on how to improve the teaching and learning of primary level mathematics education within resource-constrained contexts. It builds on two large numeracy projects within South Africa which speak to broader, global concerns and highlight how research and development not only enables one to meet ethical imperatives but also explore how further interventions can be developed. Teacher and research communities must work together to create mutually beneficial relationships and establish a cohesive understanding of the requirements of primary mathematics education. Mellony Graven is the South African Chair of Numeracy Education at Rhodes University, South Africa. Her work as Chair involves the creation of a hub of mathematical activity, passion and innovation that blends teacher and learner numeracy development with research focused on searching for sustainable ways forward to the challenges of mathematics education. Hamsa Venkat is SA Numeracy Chair at Wits University, South Africa, where she is leading a 5-year research and development project in primary mathematics. Her work focuses in the areas of Mathematical Literacy and Primary Mathematics teaching and learning. SECTION I: INTERVENTIONS FOR QUALITY AND EQUITY IN PRIMARY EDUCATION.- Chapter 1. Intervening in Contexts of Poverty; Jill Adler .- Chapter 2. 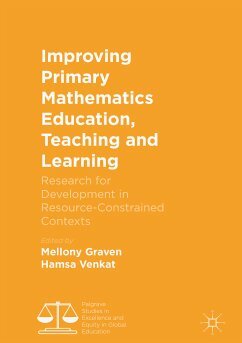 Theorising the Primary Mathematics Landscape in Contexts of Poverty; Mellony Graven and Hamsa Venkat .- SECTION II: ASSESSING NUMERACY PROGRESSION IN RESOURCE CONSTRAINED CONTEXTS.- Chapter 3. Using Assessments to Explore Early and Later Performance in Mathematics; Marie Weitz and Hamsa Venkat.- Chapter 4. Researching the Nature of Early Numeracy Progression in After School Clubs; Debbie Stott.- Chapter 5. Adapting Aspects of the Mathematics Recovery programme for use in various South African contexts; Debbie Stott, Zanele Mofu & Siviwe Ndongeni.- SECTION III: UNDERSTANDING LANGUAGE ISSUES IN PRIMARY MATHEMATICS TEACHING, LEARNING AND ASSESSMENT.- Chapter 7. Using an Adapted Model of Reciprocal Teaching to Help Children Unpack their Word Sums; Melissa Spira & Sally-Ann Robertson.- Chapter 8. Language in Early Number Learning in South Africa: Linking Transparency and Explicitness; Manono Mdluli.- Chapter 9. Learners Exemplifying for Themselves: Grade 2's Telling Additive Relations Stories; Nicky Roberts.- Chapter 10. Do the Annual National Assessments in Mathematics Unfairly Assess English Language Competence at the Expense of Mathematical Competence? ; Lucy Sibanda.- SECTION IV: SUPPORTING CHANGE IN PRIMARY MATHEMATICS TEACHING.- Chapter 11. Changing Tteaching through a Resources Approach; Hamsa Venkat and Mellony Graven.- Chapter 12. From Theory to Practice: Challenges in Adopting Pedagogies of Mathematizing in South Africa; Thulelah Thakane, Herman Tshesane and Mike Askew.- Chapter 13. Characterizing Responsive Primary Mathematics Teaching in the South African Context; Lawan Abdulhamid.- Chapter 14. Key Aspects of Communities of Practice that Enable Primary Maths Teacher Learning; Peter Pausigere.